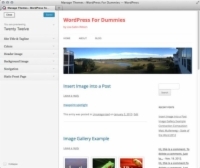 The WordPress Theme Preview option allows you to look at your site without actually activating the theme on your site. If you have a site that’s receiving traffic, it’s best to preview any new theme before activating it to ensure that you’ll be happy with its look and functionality. If you’re trying to decide between several new theme options, you can preview them before changing your live site. 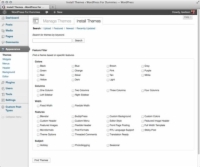 1Log in to your WordPress Dashboard and click the Themes link on the Appearance menu. The Manage Themes page appears and displays your current (activated) theme and any themes that are installed in your /wp-content/themes directory on your web server. 2Preview the theme you want to use. Click the Preview link beneath the theme name; a preview of your blog using the theme appears in a pop-up window. 3(Optional) Configure theme customization features. Some, but not all, themes are developed to provide you with customization features. 4Choose whether to activate the theme. Click the Save & Activate button on the top-left area of the preview window to go live with your new theme, or you can close the preview by clicking the Cancel button in the top-left corner. 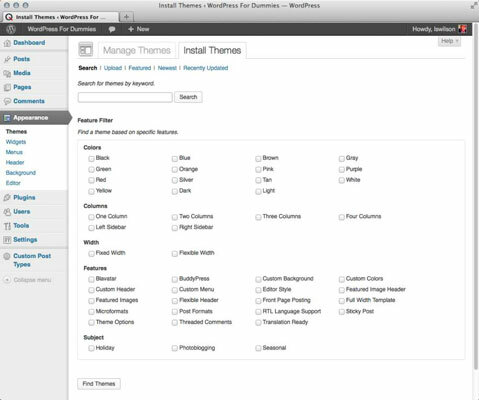 5To activate a new theme without previewing, log in to your WordPress Dashboard and click the Themes link on the Appearance menu. 6Find the theme you want to use and click the Activate link beneath the theme name. The theme immediately becomes live on your site.